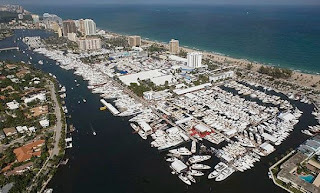 Fort Lauderdale, Florida, the "Yachting Capital of the World" will host its 54th International Boat Show on October 31 up to Nov 4, 2013. Show exhibits range from yacht builders and designers to exotic cars and brokerage yachts. A wide variety of boats and sea vessels will be on display including runabouts, sportfishers, high performance boats, center consoles, cabin cruisers, flats boats, skiffs, express cruisers, sailing yachts, motor yachts, bowriders, catamarans, ski boats, jet boats, trawlers, inflatables, canoes, and extraordinary superyachts. Covering six locations and over 3 million square feet of space, the show's transportation network of bus shuttles, water taxis, and riverboats ensures attendees can easily navigate the boat show and its expansive waterways system. Added attractions include The Blue Wild Dive Show, IGFA's School of Sportfishing and Hook the Future's Kids Fishing Clinics. The novelties at this year shows, and the latest new models from the fall in Europe already transported to the US, show a healthy boating market at the moment. Some of the World firsts come from the following builders; Back Cove 37 Downeast, Carver C40, Cruisers 328 SS Black Diamond, Foue Winns 290 Horizon, Grandbanks 50 Eastbay SX, Hatteras 100 Raised Pilothouse, Lazzara LMY 64, Marlow 58E Explorer and 60E Explorer, Sea Ray 510 Fly 350SLX and 260 Sundancer, and Viking 52 Convertible and 42 ST.